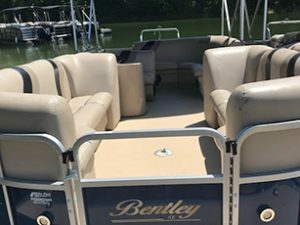 NEW for 2018 we are renting a Bentley tri-tune with a 150 hp engine. This boat will hold up to 12 people. The tri-tune offers more speed, maneuverability and stability. We have new luxury Bentley Pontoon boats with Bimini sun shades for when the sun is too hot. The pontoons are 20 and 24 foot long so they can easily hold your whole family with room to spread out. All of our boats come equipped with life jackets for all sizes and all safety equipment at no extra charge. Douglas Lake is a beautiful, quiet lake to explore and get away from the hustle and crowds. 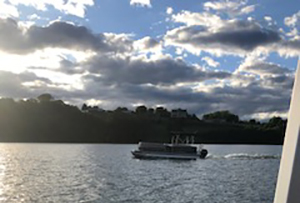 We offer more than 30 years of experience specializing in boat and wave-runner rentals with some of the most beautiful views of the Great Smoky Mountains. 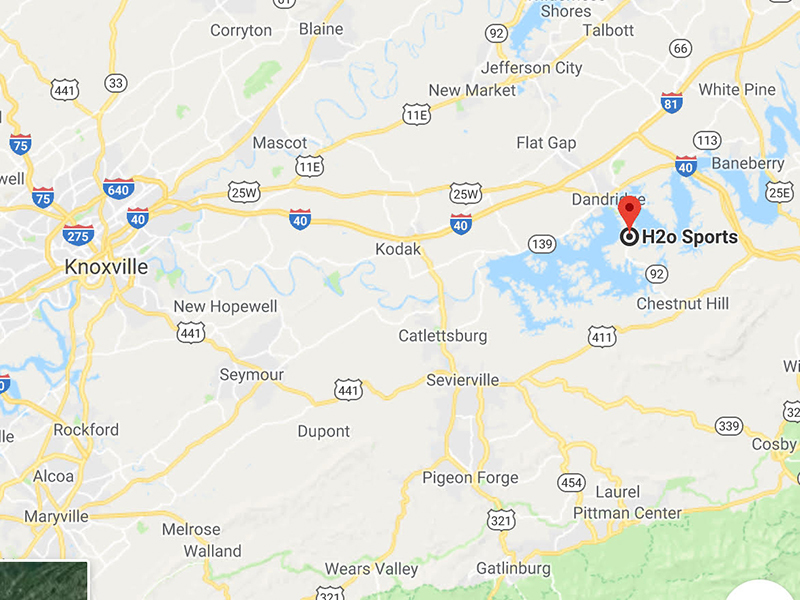 You can rest assured that between our customer service, boat valets, and a full line of Bentley pontoons as well as Yamaha wave-runners, you will have the best experience here at Smoky Mountain H2o Sports. We offer 35 pontoons and 15 wave-runners and new for 2018, Bentley Tritoon with a 150 hp engine. We also offer Jet Skis, Wave-runners and Sea Doos.We are one of the largest boat rental companies in the South. 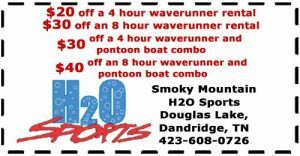 Dollar for dollar you can’t beat the deals at H2o Sports as well as the best rain policy. Reservations are recommended to ensure that you don’t miss out. Only pay for the amount of fuel that you use or you can speed up your end of the day check in by choosing the all inclusive pricing of boat and gas. Then you don’t have to wait to fuel-up. You choose what plan works best for you! 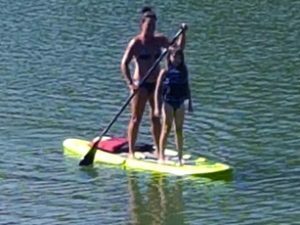 Beginners welcome and no boaters safety license is required. We will teach you everything you need to safely operate the boat or jet ski. Jet skis hold up to 3 people. We have jet skis for all skill levels from beginners to skilled riders. 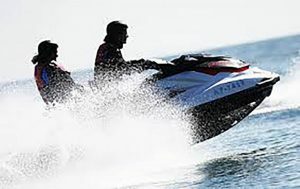 Our Waverunners, jet skis and Sea Doos are performance or luxury models. If Jet Skiing or Sea Doos just aren’t your style, come enjoy a leisurely ride on a Bentley pontoon boat. Your pontoon becomes your island while your friends or family “Jet” to and from your location on Douglas Lake. Douglas Lake offers some of the best fishing in the area too, with several tournaments held throughout the year! Douglas Lake is a beautiful, quiet lake to explore and get away from the hustle and crowds. • Great prices and a very easy rain policy. • All of our pontoon boats have changing rooms. • All of our boats come equipped with life jackets for all sizes and all safety equipment at no extra charge. 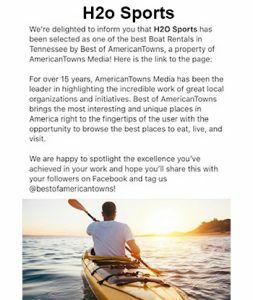 • We are located near Dollywood, Splash County, Ripley’s Attractions, Comedy Barn, Wonder Works, Jurassic Jungle Boat Ride, The Titanic, Hatfield and McCoy Dinner Show, Tanger Outlet Mall and lots of other attractions. 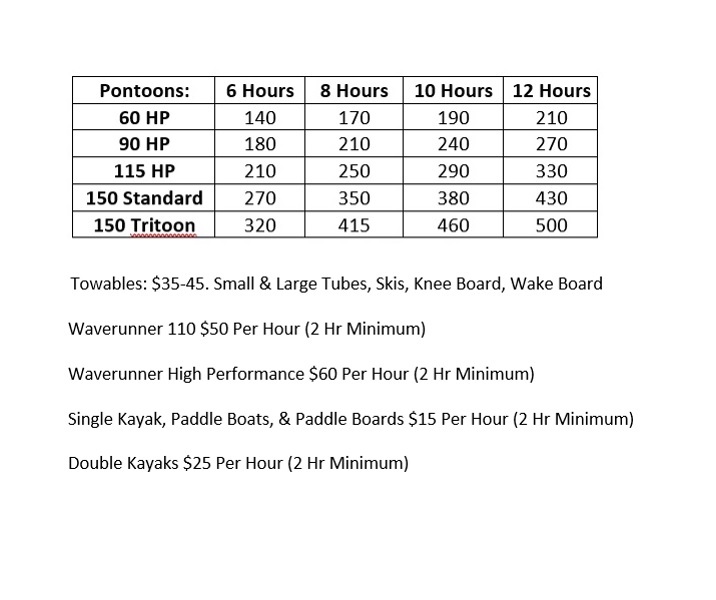 • We offer a great selection of Towables – including Tubes, Skis, Wakeboards, and Kneeboards. Planning a Smoky Mountain Family Reunion or Retreat? We can also accommodate large groups and families. Just drop in or call us at 423-608-0726 for a reservation. Prices vary according to type of equipment and number of hours rented. Be sure to be here at least 30 minutes prior to your reservation time for all reservation for check in and safety video. Rental prices DO NOT include tax or gas.